Observation - Harlequin Ladybird - UK and Ireland. 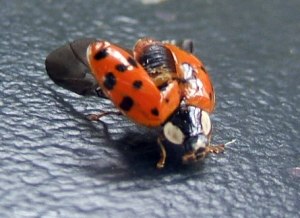 Description: Harlequin ladybird. Large numbers of ladybirds, seven spot and Harlequins, in the garden over the last week. Harlequin ladybird. Large numbers of ladybirds, seven spot and Harlequins, in the garden over the last week.